The VOR system operates on frequencies between 108 MHz and 117.95 MHz. Channel separation is 50 kHz and the signals have a horizontal polarisation. Frequencies between 108 MHz and 111.95 MHz are primarily used for the localiser part of the ILS but can be shared with short range VORs, or so-called terminal VORs. The VOR uses frequencies having an even decimal as the first digit after the last MHz digit, while localizers use odd decimals. When assigning a VOR to this part of the frequency band, it is an essential requirement that it does not interfere with an adjacent ILS channel. A sub-carrier of 9960 Hz, frequency modulated at 30 Hz, modulating the carrier to a nominal depth of 30%. 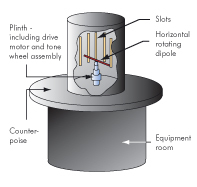 This 30 Hz component is fixed independent of the azimuth and is termed the reference phase. A 30 Hz component, modulating the carrier to a nominal depth of 30%. This 30 Hz component is caused by a rotating antenna producing a change in phase with azimuth and is termed the variable phase. When the two signals (VAR & REF) are mixed together, the resulting polar diagram will be a cardioid, but unlike the cardioid of the ADF, this does not have a «null» position. We call it a «limacon». It rotates at 30 revolutions per second. The rotation of the limacon creates an effective amplitude modulation of 30 Hz. The VOR receiver splits these two signals into the two original components. The two signals are processed through different channels and the phase of the 30 Hz modulations of the fixed REF signal and the VAR signal are compared in a phase comparator. The phase difference between these two signals is directly proportional to angular position with reference to the VOR station. 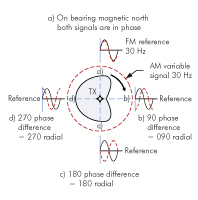 As explained, magnetic North is the normal reference for the radials, so when 0° phase difference is detected, the receiver is on the 360° radial from the station. The figure on the left shows the phase difference and variable signal at the cardinal points.